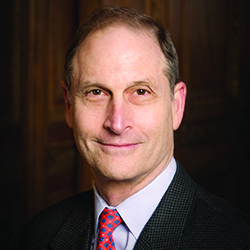 Award Year: 2002 For their Investigator Award project, David Blumenthal, M.D., M.P.P. and co-principal investigator James A. Morone, Ph.D. take on the modern American Presidency. In their study, Health Care and the American Presidency, they examine how the actions or inaction of each President from Franklin D. Roosevelt to George W. Bush have influenced the formulation and implementation of health policy in the United States. Using a variety of research techniques and models, Drs. Blumenthal and Morone expect to provide insights into the involvement of presidents in health policy issues and their role in the policymaking process. Their work should contribute to our understanding of the policy process and inform the activities of presidents, their staffs, other government officials, and stakeholders. David Blumenthal is the President of The Commonwealth Fund in New York. Until 2012, Dr. Blumenthal was the Chief Health Information and Innovation Officer at Partners HealthCare. He is also the Samuel O. Thier Professor of Medicine and physician at The Massachusetts General Hospital/Partners HealthCare System in Boston and professor of health care policy at Harvard Medical School. Previously, he was senior vice president at Boston's Brigham and Women's Hospital. From March 2009 until April 2011, Dr. Blumenthal was appointed by President Obama as the National Coordinator for Health Information Technology, U.S. Department of Health and Human Services. In this role he led the implementation of a nationwide interoperable, privacy-protected health information technology infrastructure as called for in the American Recovery and Reinvestment Act. Dr. Blumenthal is a member of the Institute of Medicine of the National Academy of Sciences, a National Associate of the National Academy of Sciences, and serves on several editorial boards, including the American Journal of Medicine, Journal of Health Politics, Policy and Law, and the Bulletin of the New York Academy of Medicine. He is also a national correspondent for the New England Journal of Medicine. Dr. Blumenthal was the founding chairman of AcademyHealth (formerly the Academy for Health Services Research and Health Policy). In 2008, he received a Distinguished Investigator Award from AcademyHealth. He is also director of the Harvard University Interfaculty Program for Health Systems Improvement. From 1995 to 2002, Dr. Blumenthal served as executive director for The Commonwealth Fund Task Force on Academic Health Centers. He has served as a trustee of the University of Chicago Health System and currently serves as a trustee of the University of Pennsylvania Health System. During the late 1970s, Dr. Blumenthal was a professional staff member on Senator Edward Kennedy's Senate Subcommittee on Health and Scientific Research. His research interests include the future of academic health centers, quality management in health care, the determinants of physician behavior, access to health services, and the extent and consequences of academic-industrial relationships in the health sciences. Blumenthal, D. Expecting the Unexpected: Health Information Technology and Medical Professionalism, In Medical Professionalism in the New Information Age, eds. Rothman, D.J., Blumenthal, D. New Brunswick, NJ: Rutgers University Press, 8-22, 2010. Blumenthal, D., Morone, J. The Presidency, In Health Politics and Policy, 4th Edition, eds. Morone, J.A., Litman, T.J., Robins, L.S. Delmar Cengage Learning, 2008. Blumenthal, D. A Physician Goes to Washington . . . and Safely Returns. JAMA, Jan 4 2012, 307(1): 45-46. Blumenthal, D. 2012-A Watershed Election for Health Care. NEJM, Dec 1 2011, 365(18): 2047-49. Blumenthal, D. Implementation of the Federal Health Information Technology Initiative. NEJM, Dec 22 2011, 365(25): 2426-31. Buntin, M., Burke, M., Hoaglin, M., Blumenthal, D. The Benefits of Health Information Technology: A Review of the Recent Literature Shows Predominantly Positive Results. Health Affairs, Mar 2011, 30(3): 454-463. Blumenthal, D. Wiring the Health System-Origins and Provisions of a New Federal Program. NEJM, Dec 15 2011, 365(24): 2323-29. Blumenthal, D. Stimulating the Adoption of Health Information Technology. NEJM, 2009, 360(15): 1477-9. Morone, J.A., Blumenthal, D. Nine Lessons for Health Reform: Or Will We Finally Learn from the Past? J of Law, Medicine and Ethics, 2008, 36(4): 722-4. Blumenthal, D., Morone, J. The Lessons of Success - Revisiting the Medicare Story. NEJM, 2008, 359(22): 2384-9. Blumenthal, D. Employer-Sponsored Health Insurance in the U.S. - Origins and Implications. NEJM, 2006, 355(1): 82-8. Rothman, D.J., Blumenthal, D. (eds.) Medical Professionalism in the New Information Age. New Brunswick, NJ: Rutgers University Press, 2010. Blumenthal, D., Morone, J.A. The Heart of Power: Health and Politics in the Oval Office. University of California Press, 2009.